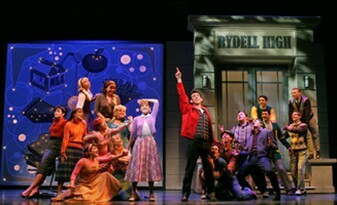 The big question about the second Broadway revival of Grease, the 1950's rock and roll high school musical, is how successful is choosing stars for a stage show by television competition. The answer based on the results is that it is not a very good method. Max Crumm as greaser Danny Zuko and Laura Osnes as nice girl Sandy Dumbrowksi were chosen by the national television audience on Sunday, March 25, 2007, the last night of the NBC talent competition series of Grease: You're the One That I Want. On stage, Crumm and Sandy prove to be attractive, talented singers but very bland actors. It could be their inexperience as they are both still very young. However, they are outclassed by the Broadway veterans that surrounded them at the Brooks Atkinson. 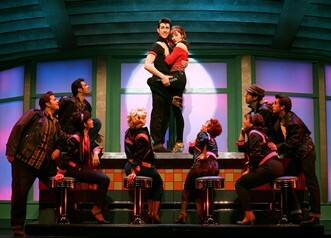 Grease is an audience show. The 1978 film version of Grease with a slightly different story line has probably been seen by every teenager in America. However, it was never witty or clever. Its message that conformity is necessary in order to be accepted as a teenager and that individuality is a social mistake is not one to please critics or intellectuals. The new production by director-choreographer Kathleen Marshall is energetic, lively and entertaining without offering any new approach. The rock and roll score by Jim Jacobs and Warren Casey is made up of songs that have become classics. 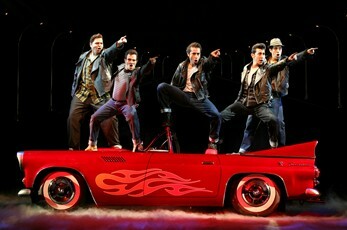 With one in every scene, Marshall's Grease is big on dance and production numbers. The show has no specific style though Derek McLane's colorful and serviceable sets use a great deal of pink and baby blue. Laura Osnes (Sandy), Max Crumm (Danny) and Company in "Summer Nights"
Why a new Grease following so closely on the heels of the first revival which opened in May 1994 with future television stars Rosie O'Donnell and Megan Mullally and ran until January 1998? Aside from the marketing device of choosing the two leads by national television search, this Grease includes four songs from the hit 1978 movie: Barry Gibbs' "Grease," now the opening number; John Farrar's "Hopelessly Devoted to You" sung by Sandy; Scott Simon and Louis St. Louis' "Sandy" sung by Danny when he finds himself alone at the drive-in; and John Farrar's "You're the One That I Want" sung by Danny and Sandy, their reconciliation number at the Burger Palace as part of the show's finale. As a result, four of the original Jacobs-Casey songs have been dropped: "Alma Mater," "Alma Mater Parody," " Alone at a Drive in Movie," and "All Choked Up." Farrar, it may be recalled, often wrote songs for Olivia Newton-John who played Sandy in the film. Matthew Saldívar (Kenickie) and Company in "Greased Lightnin' "
Aside from Crumm and Osnes, the rest of the cast seem more than a bit long in the tooth to be playing high school teenagers. However, this is where experience counts. Jenny Powers' hard-boiled Betty Rizzo is a knockout delivering "There Are Worse Things I Could Do" and "Look at Me, I'm Sandra Dee." Lindsay Mendez's Jan brings down the house singing "It's Raining on Prom Night" at the dance at the school gym. As Teen Angel, Stephen R. Buntrock has a great deal of fun singing the parody, "Beauty School Dropout" to Kirsten Wyatt's Frenchy. Ryan Patrick Binder as Dooty and Matthew Saldívar as Kenickie along with the male ensemble turn "Those Magic Changes" and "Greased Lightnin'," respectively, into the show-stopping numbers they were intended to be. Robyn Hurder's Marty makes "Freddy, My Love" into a plaintive expression of first love. Then why is this Grease a disappointment? Marshall has not been able to develop the stereotyped characters beyond their clichés. Aside from Power's tough girl Rizzo and an over-the-top performance by Natalie Hill as Cha-Cha DiGregorio, no one has enough attitude to make their roles indelibly their own. Marshall's production numbers for "Summer Nights," "We Go Together" , "Shakin' at the High School Hop" , "Born to Hand-Jive," etc., are rousing but they seem generic rather than inspired. 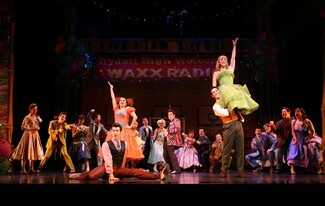 As Danny and Sandy, Crumm and Osnes are pleasant enough but our eye always goes to others on stage during the dialogue. 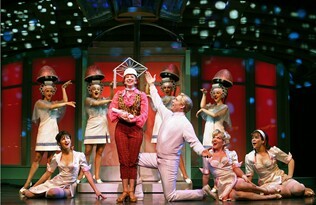 and Company in "Beauty School Dropout"
The new Grease is diverting entertainment and is excellently sung. It can boast one of the best sound designs, courtesy of Brian Ronan, to be heard on Broadway in which every word is crystal clear. The orchestra which is housed above the stage is distractingly revealed periodically, but this seems a momentary aberration. Go expecting to have a good time. Just don't expect a reinvention or the discovery of any new stage stars.